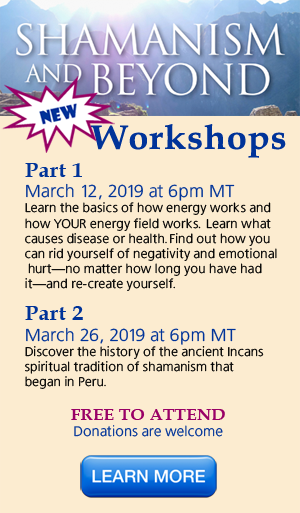 Mary Raymakers is a World-Renowned Master Sacred Shaman, and Executive Director and instructor for New Wisdom University, an international spiritual organization. For over twenty years, Mary has been unleashing people’s unlimited potential to empower them to live their life’s true purpose. In her shamanic practice, Mary has worked with thousands of people to help them create significant emotional, mental, spiritual and physical changes. She intimately knows how to get you out of your own way to create even greater professional and personal success! Mary discovered that it is one thing to help her clients clear the blocks that prevent them from feeling fully alive, fulfilled and purpose-driven with her shamanic work, but she often found that people needed some additional coaching and step-by-step instructions—like getting a new roadmap for life—in order to recreate their lives to live fully, passionately and on-purpose. are excited to be offering a new Soul Healing series that will provide students with the necessary steps to actually heal their souls and then recreate themselves to live their dream life. You will soon find more information on the Soul Healing series under the heading “Study with Mary” above, so keep watching. Mary is currently housed in Jackson, Wyoming, at Medicine Wheel Wellness, a holistic alternative care wellness center that incorporates the healing of body, mind, emotion and spirit. Here, she works with people in person, but she also works with people from around the world via phone and Skype. Are you ready to feel an even greater sense of clarity, passion, freedom and purpose? Whatever is holding you back—from negativity, to addictions, to pain and hurt (such as grief, fear and doubt, unworthiness and low self-esteem) to being victimized by abuse of any kind, to toxic relationships—you can overcome and gain your freedom to live YOUR life as the greatest expression of the REAL you. A shaman is one who understands the laws of both the spiritual or energetic dimension and the material world and works with the spiritual elements to change the material elements. Thus, a shaman can erase the burdens found in our lives and bring balance. Mary’s work includes workshops, retreats, unique one-on-one experiences, private sessions and radio and television interviews. Mary has been a frequent guest on television and radio (click on Video for some episodes), and is a sought-after retreat speaker. Honor yourself and all of creation.